Whereas many textbooks treat the subject of world religions in an apolitical way, as if each religion were a path for individuals seeking wisdom and not a discourse intimately connected with the exercise of power, James W. Laine treats religion and politics as halves of the same whole, tracing their relationship from the policies of Alexander the Great to the ideologies of modern Europe secularists, with stops in classical India, China, and the Islamic world. 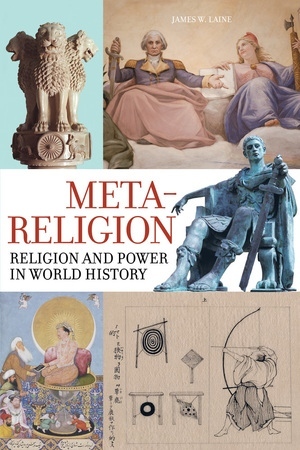 Meta-Religion is a groundbreaking text that brings power and politics to the fore of our understanding of world religions, placing religion at the center of world history. This synthetic approach is both transformative and enlightening as it presents a powerful model for thinking differently about what religion is and how it functions in the world. With images and maps to bring the narrative to life, Meta-Religion combines sophisticated scholarly critique with accessibility that students and scholar alike will appreciate. James W. Laine is Arnold H. Lowe Professor of Religious Studies at Macalester College. PART ONE. RELIGION AND EMPIRE IN ANTIQUITY, 330 B.C.–710 A.D.
1. Alexander and Ashoka: Cosmopolitan Empires and Religious Policy from Egypt to India, 330–230 B.C. 2. Imperial Religion: China to Rome, 250 BC–250 A.D.
5. The Rise of Islam and the Early Caliphate, 622–711 A.D.
PART TWO. THE ISLAMIC MILLENNIUM, 700–1700 A.D.
6. Imperial Islam, 690–1500 A.D.